I could not put this book down..... It opens the door and welcomes us into the author's amazing and unusual life. Milan K. tells his story with a raw, yet humorous, honesty. The book is so well written that I found myself swimming happily in the detail (which is saying something since I'm the type of lazy reader who is normally ferreting out the bones of a story and ignoring the rest). Read this book and take yourself on a luscious and thought provoking journey. I promise you won't be disappointed. When a friend gives you a book that he wrote for you to read, you can easily be prompted to think: "Well, this is not what I want to read right now, but I will... so that I can tell my friend that I did!" And I have to confess that these thoughts were mine when I was given this book by its author. How wrong I was! 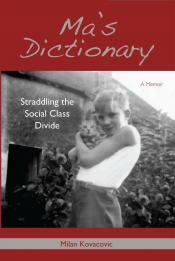 I read this memoir, which to me felt like half a novel, half a sociological study, with so much pleasure! As I was discussing it with another friend who had read it too, we came up with the idea that each chapter, or paragraph, was like a piece of chocolate that you could savor anytime you felt like it. That is what Milan's writing does to your brain: a mix of linguistic beauty (it makes you love English even more to see what you can do with it) and intellectual revelations, exposed ever so gently, with a graceful modesty. If you are a reader, there is no way this book will not touch a part of your intellect and meet your spiritual expectations. It might even make you want to share it with people around you (I am not counting the times when I had to share a passage with the person around me, and all the quotes I intend to use one way or another). Thank you for this gift, Milan! The author writes honestly about his amazing life story which propels him across country and class lines repeatedly in his youth. He tells interesting stories to capture his environment and shows great insight about the people and the circumstances around him. I thought this book would be interesting since I had been a student of his at UMD 25 years ago and found him to be a great professor who had an unique outlook on things, but I was surprised at how captivated by this memoir I was, I couldn't put it down! I will whole heartedly recommend this to anyone who wants to read about a thoughtful reflection on an interesting life.